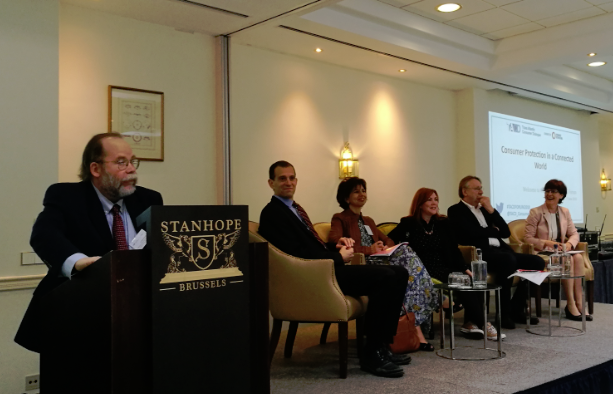 The 18th TACD Annual Forum ‘Consumer Protection in a Connected World” took place on Tuesday, 19 June 2018 in Brussels. The Forum brought together over 100 participants from all stakeholder communities. The focus of this year’s event was to examine, through panel discussions, the impact that technology has on consumers in our ever-connected world. It examined such impacts through the lens of trade, food, addictive technologies, financial services, cybersecurity and artificial intelligence. The Forum was moderated by Brussels-based journalist Jennifer Baker, and designed to engage the audience as much as possible in the discussion. The Twitter hashtag (#TACDFORUM2018) was used over 100 times on the day. The main tweets have been compiled into a Twitter moment which can be found here. The public forum kicked off with a fireside panel discussion on current trade realities, deregulation in the U.S and the EU’s new deal for consumers. On the panel we had TACD’s EU co-chair Monique Goyens (BEUC), Robert Weissman (Public Citizen), Bernd Lange (Member of the European Parliament) and Luisa Santos (BusinessEurope). Bernd Lange talked about the risk of an EU-U.S. trade war and the effects it would have on consumers, notably increased prices and less consumer protection. He noted that whilst the U.S. was continuing down its path of deregulation, the EU and the rest of the world should continue to focus on consumer protection and precautionary policies. The EU’s proposal for collective redress, part of the new deal for consumers, was highlighted by Monique Goyens, who discussed how it differs from US class actions. 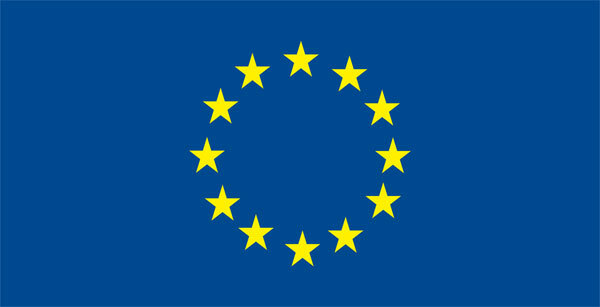 Robert Weissman argued that despite the proposal being a good step forward in allowing consumers in EU countries to enforce their rights, it had too many safeguards in place to make it effective. In the second session, we looked at the impact of technology on youth and democracy, and how these social media platforms are designed to be addictive. On the panel, which led to a lively debate, we had philosopher and social scientist, Joe Edelman, Privacy International’s Frederike Kaltheuner, EPIC’s Sunny Kang and Microsoft’s Cornelia Kutterer. The panel discussed, inter alia, whether too much focus is being placed on personal data when we talk about regulating technologies. Joe Edelman said that maybe taking a wider and more holistic approach to technology regulations, as for example with urban environments, would be a better approach. Frederike Kaltheuner likened systems such as google and Facebook to private shopping malls, rather than urban environments, all of which are controlled by a handful of companies who decide what we as the user/consumer gets to see. The effects of online marketing techniques of unhealthy food high in sugar, fat and salt to children was under discussion in session three. The Norwegian Consumer Council’s Kaya Lund mentioned their research on teens and social media marketing of food high in fat, salt and sugar. The research found that teenagers were often unaware of the tricks used by advertisers and how they were influenced by this type of marketing. However, whilst noting that there is a link between advertising and childhood obesity, WHO’s Jo Jewell pointed out that a child should not necessarily be aware that food was being marketed, but that we should rather look at how to reduce the harm of this type of marketing. The American University’s Kathryn Montgomery explained how the U.S. consistently fails to self-regulate marketing of unhealthy food to children and that due to the elaborate nature of many adverts, we need new and more ambitious policies to restrict these marketing tricks. Session 4 – Fintech – how to achieve gain without pain? Technology has had a big effect on the financial services industry and the fourth panel discussion looked at the effects on consumers. During the session, Ira Rheingold, National Association of Consumer Advocates, U.S., mentioned how technology itself is not the problem, but rather how it is used. The European Commission’s Peter Kerstens of DG FISMA warned that fintech could be detrimental if used to profile people for mortgages and insurance and target individuals with specific content. Federal Trade Commissioner, Rohit Chopra discussed the ways that fintech could be made fair to consumers and promoted the idea that it is not a case of human vs machine, but rather how human intervention in addition to machines needs to be used to prevent discrimination in a marketplace that is driven by algorithms. The hot topic of cybersecurity and the need for binding minimum standards for Internet of Things (IoT) to ensure that devices are less vulnerable, was emphasised during the fifth panel discussion. Despina Spanou, Director at the European Commission’s DG CONNECT started the discussion by explaining why we need to build expertise in cybersecurity within the consumer movement. Throughout the discussion, it was made clear that there was no such thing as a quick-fix solution. Tackling cyber security of IoT and creating the necessary binding rules would take time. An interim solution raised by Finn Myrstad from the Norwegian Consumer Council was to hold traders of devices that are not cyber-safe accountable, which would in turn put pressure on the global value chain. The European Commission also noted that it would take a few years to create and implement any new EU policies or regulations in this area. Final session: is Artificial Intelligence undermining consumer protection laws? In the final session, the topic of algorithms was the focus of the discussion on Artificial Intelligence (AI). The World Privacy Forum’s Pam Dixon spoke of the many factors that go into an algorithm and the need for ethical guidelines. The potential downfalls of AI were discussed by Federal Trade Commissioner Rohit Chopra, who questioned how AI will fit into existing laws on (e.g.) discrimination and consumer protection, and what the effect would be on society. Consumers International’s Justin MacMullan gave an example of how algorithms had been used to the detriment of consumers in the UK where people with Hotmail accounts were considered to be a higher risk to insurers and therefore required to pay 30% more for insurance than those with other e-mail accounts. Achim Klabunde of the European Data Protection Service was, however, quick to point out that we cannot use algorithms as an excuse, as humans still have responsibilities. This point was further re-enforced by Pam Dixon when she noted that how we interpret the findings of AI systems is just as important, if not more, than what we feed into them. What was made clear throughout was that aside from having ethical guidelines, in order for AI to be used to the advantage rather than the detriment of consumers and society, AI systems would need to be more understandable and transparent. The full programme of the day can be found here.